Shamanism at Blue Morpho is rooted in traditional Amazonian medicine practice, as taught in Maestro Alberto’s lineage. Amazonian shamanism, as you will read more in the following sections, is a mixture of plant-based spiritual arts of which there is a great variety. Among these, the medicine arts of Amazonian shamanism are primarily focused on healing. This healing can include physical ailments but also extends into the psychological, emotional, and spiritual elements of sickness or suffering. In addition to the Amazonian tradition, our shamanism incorporates a number of transformational tools to support the journey of change and evolution you are embarking upon. In our workshops, we incorporate the principles of Modern Shamanism, which is a refined and effective practice of shamanism intended for modern peoples living in the modern world. We also work from a platform of universal consciousness and mystical philosophy that unites all realms of spirituality within the Medicine World, a shamanic space that is entirely based in Love. Each of these disciplines is a standalone, potent practice. Together, they form a healing and transformational modality that makes Blue Morpho a one-of-a-kind experiential journey. Shamanism is a term that originally refers to the spiritual practices of the indigenous peoples from far northern Europe and Siberia. The term itself is a modification of the Tungusic word šaman, which means “one who is ecstatic” or “one who knows the spirits”. The primary beliefs of these cultures include the belief in spirits, the ability of human beings to interact and communicate with these spirits via various processes including leaving the body (soul flight); and a belief in a multi-tiered universe made up of a higher, middle and lower plane that the spirits dwelled within. Adapted into the English variant shaman, the term has become a widespread anthropological signifier for traditional practitioners all over the world that hold similar spiritual belief systems and means of engaging these systems using a variety of methods and ceremonies. The presence of such similarities within cultures, across both time and space, has evolved into the common-usage pattern of the word shamanism that we see in today’s modern world. Because of this, a great deal of the specific meaning has been lost. Many local cultures and traditions, while recognizing the shamanic nature of their practices, retain their own terminology for their spiritual specialists. The Amazon is a good example of this, where it is common to differentiate practitioners based on the types of plants that they specialize in. For instance, shamans who specialize in ayahuasca are called ayahuasqueros; shamans who specialize in medicinal trees are called paleros; and specialists in the sanango trees are known as sanangueros. The Peruvian Amazon is also a perfect example of the general expansion of the use of the term shamanism. Prior to outside influence, native traditions and their practitioners were known solely by their local names. Over the last few hundred years, outside influence has penetrated the jungle cultures and this has in turn affected the expression of native practices. It is now common for practitioners to be referred as and know themselves by the local name (e.g. ayahuasquero) as well as shaman. The Amazon has also seen the emergence of a new type of shaman distinct from the indigenous practitioners, known as Mestizo (Don Alberto is considered a Mestizo shaman). This group is generally an ethnic mix of indigenous and European ancestry, identified by a cultural expression distinguishable from tribal societies yet not recognizable as inherently modern or Western. It is a unique expression resulting from the last few hundred years of cross-cultural exchange and evolution. With this evolution has emerged a unique form of shamanism. Now, in the last few decades, the Peruvian Amazon has become home to foreigners who have left their native countries to live in the Amazon to learn the traditional shamanic practices. At a fundamental level, shamanism is a practice of spirits. To a shaman, all things are understood as spirits. This includes everything that we know as physical – bodies, buildings, objects, food – and everything that we know as non-physical – thoughts, feelings, presences, disembodied entities and so forth. It also includes all scale, from the greatest container of the Universe down to the smallest particle of energy. From a shamanic perspective, everything that exists is a spirit. The key elements in most shamanic practices consist of the shaman, who has learned to mediate, guide, and act on behalf of the spirits; the participants/patients, who receive the benefit, knowledge, healing and guidance as a result of the shamanism; the ceremony, which is the specific time and location the spiritual work is carried out; and the presence of the spirits themselves. Through extensive training and apprenticeship, shamans cultivate unique relationships with specific spirits and the knowledge of how to wield them. As the shaman grows in their practice, these relationships grow stronger and they continue to add more diversity to the spirits with whom they work and how they apply and express this spiritual knowledge. Being a practice of spirits, the nature of shamanism is dualistic in its core expression. The shamanic journey is a journey into the vastness of the universe, consciousness, mind, imagination, dimensions and spiritual worlds. There is always a locus of consciousness that is in relationship to the outer, the other, the dimensions and beings that are being explored. This is a basic subject-object dichotomy, with the subject or central point as the shaman (or participant) and the object as the spirits and realms of exploration. This inherent dualism is rarely if ever transcended and typically maintained at all times as the shaman is in communication with the spirit world and individual spirits. This core definition often leads to traditions that are embedded in light/dark, good/bad, right/wrong, healing shaman/malevolent shaman, and so forth. Shamanism in the Peruvian Amazon is widely expressed as a mixture of traditional and non-traditional spiritual practices. Traditional practices refer to belief systems and world views that were intact prior to the Colombian era. Since the 16th century onwards, there has been continuous cultural evolution that directly and indirectly impacted the shamanism throughout the entire region. One of the primary expressions of this intermixing is the adoption of Christian motifs and themes within the largely plant and spirit-based shamanic healing methods. This blending of traditions is very apparent in what is currently known as Mestizo shamanism. It is also common to see contemporary spiritual terminology easily and quickly adopted by Amazonian practitioners. For example, use of words like chakras or energy in recognizably Western contexts. This process of cultural exchange is ongoing and has recently intensified. As more and more foreigners come to the Amazon, it is inevitable that the practices will evolve into new forms and expressions. As described earlier, traditional shamanism is rooted in a spiritual reality – meaning that the core philosophy of the practice is a philosophy of spirits. In the Amazon, this reality is heavily connected to the environment; hence one of the primary means of spiritual connection and engagement is via plant spirits, ayahuasca being one of the principal means of accessing the shamanic realms. Shamans of the Amazon also work with a number of other healing plants, including medicinal trees, tobacco, plants from the Sanango family, and a host of other types of plants. The traditional shamanic philosophy maintains that plants, animals, and other elements of the universe contain different spirits. Some of these spirits are considered doctors and it is believed that these doctor spirits can interact with and heal patients in a variety of ways, typically via a trance state. The shaman is present to guide the trance and the interaction between patient and spirit. The doctor spirits in turn teach the shaman their medicine. In the Amazon, this is often expressed in the form of icaros, which are medicine songs and chants taught directly to the shamans by the plant and doctor spirits. Other common healing practices include: venteadas – personal shamanic healings between a shaman and patient; soplas – the “blowing” of spiritual energies into the body of a patient; and chupadas – the “sucking” out of dark or harmful energies out of a patient’s body. While there are commonalities among many Amazonian practitioners, there are also many differences that distinguish individual shamans, lineages, bloodlines and traditions. Within such differentiation you find a variety in healing methodology, belief, philosophy, dieta practices, icaros, spirits worked with, ceremonial protocol, and so on. The shamanism found in this part of the world is a living, dynamic expression that continues to change and evolve as new elements are introduced and the culture of the Amazon itself adapts to the changing and multifaceted nature of today’s global shamanic environment. Amazonian shamans are typically named for the plants that they specialize in. The shaman learns different shamanic abilities and capacities from the different plants they use. It is possible for the shaman to specialize in different plants, and their titles will reflect this. At Blue Morpho, the shamans are considered masters of three disciplines: Ayahuasca, Palos, and Sanango. The ayahuasquero specializes in the use of ayahuasca. Ayahuasca is traditionally made with two prinicipal ingredients, the ayahuasca vine and chakruna leaves. Our ayahuasca also includes mapacho (jungle tobacco) and a variety of medicinal tree barks. The shaman hosts ayahuasca ceremonies where they function as guide and healer by invoking healing spirits through icaros. The icaro acts as a system of communication between the shaman and the spirits, as well as the participants in the ceremony. As the shaman sings they manage all of the energies present in the ceremony. The ayahuasquero trains through a strict apprenticeship that includes drinking ayahuasca hundreds of times in the presence of a maestro over several years. The palero specializes in the use of the Amazonian medicinal trees. The shaman typically uses the barks of the trees in teas that are administered during dietas. The paleros are divided into two principal types. The first is from high jungle (jungle that does not experience seasonal flooding in the year) and the second is from low jungle (jungle that does experience seasonal flooding). This differentiation signifies the different species of trees that the different types of paleros work with. It is possible to train with and work with both sets of trees if the shaman has access to the different species. This is the case with Don Alberto, who lives in a mid-zone and has access two both high and low jungle. The palero shaman trains under the tutelage of their maestro while following strict dietas (shamanic fasts) to learn the traditional tree medicine forms. The sananguero specializes in the use of the Sanango trees. While there are different types of sanango, the majority of the shamans utilize Uchu (spicy) or Chiric (shivering) Sanango. Sanago is typically administered during dietas where a solution of the root bark and water is drunk late at night. The sanango is considered a very powerful and potent medicine in the Amazon, noted for its deep cleanse and purge. It is considered to relieve the participant of all kinds of dark or illness producing energies. The sananguero shaman trains under the tutelage of their maestro while following strict Sanango dietas over the course of several years. It is during these dietas that the apprentice learns the medicine of the plant spirits. In Amazonian traditional plant medicine, the Maestro Ayahuasquero is an expert in ayahuasca medicine and acts as the traditional practitioner and keeper of sacred plant wisdom. The Maestro Ayahuasquero plays a necessary and universal role in the practice of plant medicine, which is ubiquitously acknowledged by their local communities. They first go through the strenuous spiritual and physical rigors of apprenticeship. This apprenticeship will define the direction of their spiritual growth and learning. The master shaman serves as a universal link between the patient and the world of spirit, fulfilling their role in ceremony as healer and as teacher. At the beginning of each ceremony, the master shaman sets the ceremonial space. This is done by blowing tobacco smoke and using intent to open and protect the dimensional gateways through which the spirits and energies will enter and exit three-dimensional reality. Next, the maestro prepares and protects the ayahuasca to be drunk, as well as each patient by invoking the assistance of guardian spirits and singing an intent of protection into each individual serving of ayahuasca. The maestro is in constant contact with the medicine spirits. He or she will call on the medicine spirits and receive through direct communication the dose or serving for each participant. The ceremony will begin with the calling in of mareación, the overall effects of the ayahuasca. This will transport the participants into spiritual realities that transcend normal physical reality. The shaman will manage and direct the amount and intensity of mareación during the ceremony using icaros, spirits, and intention. The maestro governs the actions of the doctor spirits by singing icaros. 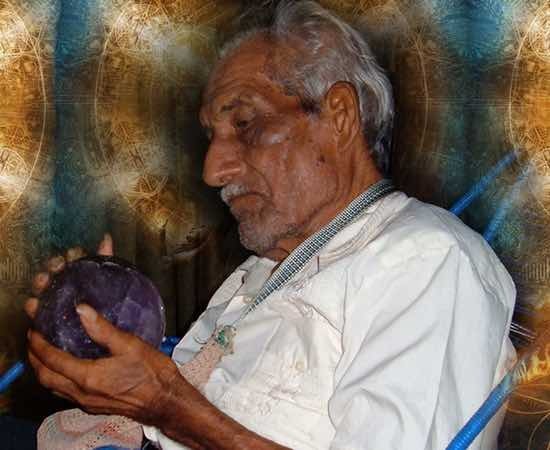 In addition, the maestro uses the shacapa (the shaman’s leaf rattle) to direct the medicine energies and to send away dark energies or spirits that have been purged by the participant. The following are some of the topics covered in the course. The “Medicine World” is the shamanic expression of a single, unified spiritual philosophy originally created by Blue Morpho Founder, Hamilton Souther. It is the result of 13 years of dedicated spiritual exploration and learning. The core principle of this philosophy is Love. In practice, the Medicine World is a specialized shamanic space that is built from universal principles. We hold and guide our ayahuasca ceremonies from within the Medicine World and by the principles that govern it. This allows us to do all of our work in a space that is based entirely in Love rather than conflict. Traditional Amazonian shamanism is held in a rigid, dualistic paradigm (good/evil, light/dark). The Medicine World revolutionizes the traditional ayahuasca experience, eliminating the need to engage in dualistic battles in order to get healing and transformation. The key principle here is that everything comes from and is an expression of Love. Love can be defined as: “the simultaneous and singular origin, essence, and manifestation of everything that is.” The Medicine World is based on specific definitions that extend from this core principle, creating a safe and stable container that enables the process of traditional shamanic healing to be carried out with tremendous speed, efficiency and efficacy. This approach enhances the healing and transformation while simultaneously allowing you to go beyond your boundaries and limitations in ways that were not previously possible. Medicine World Shamanism is designed for you to address any problem that needs a solution, any trauma that needs healing, and any form of suffering that needs to be alleviated. This is the basis for our medicine practice. When you incorporate the Medicine World with traditional ayahuasca medicine and Modern Shamanism practices, you have an incredibly powerful and transformative healing modality. All of these elements come together in an elegant and beautiful dance that is perfectly orchestrated for you to get the maximum benefit from your shamanic workshop at Blue Morpho.